This year I once again had the good fortune to be able to hunt a large parcel of private property in Shelby NY. The land is split up into three major sections of woods surrounded by fields that are leased out by the landowner to local farmers. Each year I’ve hunted the property, I’ve done my scouting based on where the crops were planted and what type of crops were up. Due to New York State changing the laws for area 8G and forcing bow hunters to harvest only doe for the first fifteen days of the season, I decided to stay away from the portion of the wooded area that was surrounded by corn. I primarily hunted two wooded areas that were surrounded by soy beans and clover. From the middle of August until the season began I set trail cameras in the areas only where I knew I would be hunting doe. The scouting worked out because I had several hundred pictures of doe as well as a lot of pictures of 1.5 and 2.5 year old bucks. I harvested two doe, one on October 1st and one on October 2nd. I kept my scent completely out of the woods surrounded by corn. My logic behind this was in years past on this property, and any farmland I’ve hunted, when it comes to farm crops it seems as though older more mature bucks hang around corn during the day time. This is not only because of the nutritious food source it provides them, but also the dense cover and protection. Due to the state law changing in my area there was no sense in trying to figure out feeding patterns for these bucks early on (as I have in years past) because you were unable to harvest them. On the opening day of buck season for bow, Friday October 16th, I decided to begin scouting the area of woods surrounded by corn. On my way into the woods I set up a trail camera on a very well-known deer trail to the corn field and decided to hunt a very wide open woods out of a two man ladder stand. I was primarily hunting this particular evening to pattern deer and see them from long distances away as they approached or left the corn field. By 4:45 p.m. I had only seen 2 doe walking away from the corn at about 100 yards. They looked as though they were entering the woods and walking toward a thicket to bed down. At this point it started absolutely pouring rain. I pulled my waterproof scent blocker jacket and hood up over my head and ducked down to endure the downpour not even watching what was going on around me. For 20 minutes I sat blindly and finally the wind and rain let up. I slowly uncovered myself and out of the corner of my right eye I caught movement. Sure enough standing right on the trail that I walked in on there was a mature 10-point buck and a year and a half old 4-point. I spent what seemed like an eternity slowly removing my hood, grasping my bow off of the bow hanger, hooking my release up to my bow string, and preparing to take a shot at this buck. The deer was very nervous and did not seem as though he wanted to walk down the trail, almost as if he had picked up my scent from walking in the woods (which is hard to believe considering how much rain had fell). So I proceeded to do what every other ethical hunter does, even though I was certain I didn’t even seriously wound this deer, I got up and checked for blood and trailed it just to be absolutely certain. I tracked him out to the edge of the corn field and sure enough not a speck of blood or hair, just kicked up leaves where he had ran and a whole lot of discouragement and disappointment coming from me. 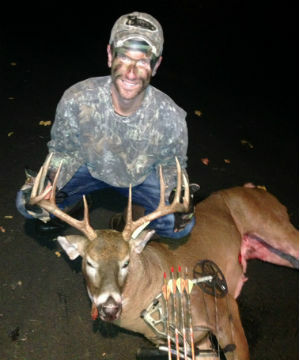 Being a fair chase bow hunter in New York State for 20 years I’d only ever seen 5-6 bucks as big as or bigger than that one. I knew he was going to go nocturnal for a while so I had already decided I wasn’t going to hunt the area for the entire week in hopes that things would settle down. While walking out of the woods on the field edge I noticed some early scrapes lined up against the wood line bordering the corn. It was a distinct line and the size of the hoof prints within the scrapes amazed me, they could easily be identified as that of a mature whitetail. Years prior I had killed a 3.5 year old 8-point in the corner of this field just inside the woods. The line of scrapes led me directly to that area. I now had a plan for the following weekend. Paul's buck from another angle. Friday, October 23rd, started off being one of those days where there was frost laying on the ground at 5:30 a.m. It was calm and clear, perfect early season whitetail weather, yet something just wasn’t right. Yup... I had to go to work. All day long I was thinking about what a perfect morning it was and the plan that I had to hunt the weekend. My focus at work (don’t tell my boss) was almost non-existent as I was thinking about how I could redeem myself for the miss the week prior. Luckily in my position I have the ability to use “flex” time for the hours that I’ve worked extra throughout the week, as I’m not eligible for overtime. Around noon on October 23rd I emailed my supervisor and asked if I could leave at 2:30 p.m. and use flex time accumulated earlier in the week. She graciously agreed and I hustled from Buffalo out to Shelby, NY to get a head start on a weekend of hunting. My plan was to set my climber up right on the corner of the field just inside the woods, with the ability to see the scrape line from my tree. When I entered the woods that night I approached the area by walking through the woods as opposed to walking anywhere near the scrapes in the field. Unfortunately there was a due east wind blowing which resulted in my scent blowing from left to right almost directly out toward the scrape line. I was nervous about the set up for that reason, but I was proactive by washing all of my clothes with scent free soap, spraying down with scent killer, and getting approximately 25 feet high in my climber. So, the hunt began. It was approximately 3:45 p.m., the sun was shining, and it was approximately sixty degrees when I was completely set in my tree and hunting. Aside from seeing gray squirrels and red squirrels the first hour was very uneventful. I had noticed that in the hour I was sitting there the temperature had dropped pretty drastically (approximately 10 degrees). At right around 4:45 p.m. I heard a loud crashing noise that was coming from the open block of woods directly in front of me. There was undoubtedly a major buck fight going on. It was close enough to where I could hear branches breaking, leaves being kicked up, and the obvious clamoring of antlers. The hair on my arms was standing straight up and I was shaking with excitement. These were obviously not small deer fighting. Although I attempted looking from every angle possible, I could not catch a glimpse of a deer in the direction of the noise. Approximately fifteen minutes later all of the noise ceased and disappointment set in... nothing. Time just went by with me standing on my climber platform in anticipation of a deer stepping into one of my shooting lanes inside the woods; however all I heard was a grey squirrel barking in the distance that was still adamantly disturbed by the recent fight he had witnessed, but saw no movement. Just as I had decided to sit back down I checked the time on my phone... 5:47 p.m. As soon as I took a seat back in the chair of my climber I looked out into the field and, sure enough, approximately 100 yards away out stepped a buck slowly walking down the scrape line. It was hard for me to tell with the naked eye how big the rack was, but I immediately knew it was a respectable buck. His antlers were bright white against the skyline. The deer stopped in the field to freshen a scrape approximately 80 yards away. As I watched him freshen the scrape I was well aware there were two more scrapes between him and I and precious seconds were ticking off the clock. Spending what seemed like an eternity on that scrape he slowly strutted his way down the field edge toward my stand and the next scrape. Once again pawing the ground and licking branches above his head. Time was ticking. Knowing that the window for being within legal shooting time was approaching I was getting very nervous. Watching this deer was spectacular, however just as every hunter aspires I wanted this story to end with a successful harvest. At the beginning of the hunt I broke off two branches to give myself a shot into the field from my climber. As the deer approached the final scrape 25 yards from my stand I was hoping he would stop and turn as he freshened the scrape. This definitely did not occur, and worried me because I had no idea which direction the deer was going to head in once he left the scrape. The scrape line I had identified ended at the corner of the field. As the deer pawed the scrape, for the first time in my hunting career I could literally hear his urine hitting the ground below the brush. When he looked up to lick the branch was the first time I could absorb how big his rack really was. I knew this would be my biggest buck harvest ever. I’m certain it was partially due to the temperature drop, but my entire body started shaking and I think I could hear my own heart beating. I’ve never had such a close encounter with such a gorgeous animal during such an action packed scenario. It was definitely the kind of experience I would have loved to have had on film. After spending five minutes, 25 yards or closer, freshening the last scrape the deer slowly entered the brush to my right and angled in the woods toward my stand. When he entered the open woods he became very nervous and moved slowly almost as if he was stalking something. The buck did not present me with a shot even though he stood 12 yards in front of my stand, he remained in the brush. The deer suddenly turned and started walking on an angle away from me toward the open woods. He finally turned his body and presented me with a quartering away shot that was ethical to take. I took aim and fired placing my pin on the back section of his vitals knowing the arrow would penetrate up into his chest cavity. Immediately the deer was shocked, fell to the ground, got back up, and took off running down the same trail he had come, passing each scrape. Seconds later I heard an extremely loud crashing noise that was the obvious sound of the deer falling over into the corn field dead. I looked at my phone following the shot realizing I had three minutes of legal shooting time left. Climbing down out of the tree and examining the blood trail it was obvious the rage broad head did exactly what it was designed to do. Despite this deer running 100 mph after being hit, there was at minimum a four foot wide blood trail which led me right to the animal. It was as if the rack had grown on him while on the ground. I couldn’t believe what a trophy God gave me the opportunity to harvest. Sitting there and enjoying the moment I decided to name this deer “Flex”... I can’t possibly think of a better way to use flex time from work. Having been through one of the hardest years of my life and being in the midst of a divorce, I was extremely humbled by this once in a lifetime experience. These experiences will always be my therapy. I thank the good Lord for providing, and my dad for exposing me to the outdoors because no matter what happens the woods will always be there for me. This memory will be on my wall for years and years to come! 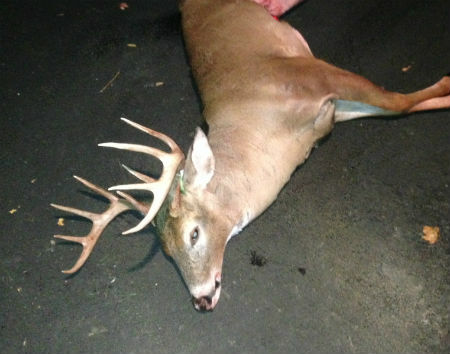 Paul's Orleans County 11-point green scored 137-6 and dressed at 190 lbs. with a 21.5” inside spread.